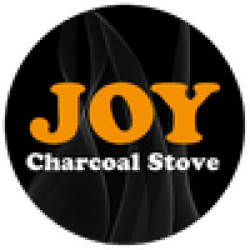 GO TO FACEBOOK.COM/JOYSTOVE TO SHARE YOUR RECIPE! 1. Line a baking tray with parchment paper and lay the bacon strips on top, layering a sheet on top and a somewhat smaller oven tray on top of it to weigh the bacon down. Place on the grill and cook for 20 minutes or until the bacon is crispy. So keep checking! Then let the bacon cool. 2. Mix the oyster sauce, ketchup and egg into the ground beef and season to taste with ground black pepper. Divide the burger meat into six portions with the help of a round mold (Ø 10 cm). Press the burgers a bit flatter as they will plump up on the grill. Let the burger mix cool for a minimum of 3 hours in the fridge to prevent the burgers from falling apart while cooking. 3. Sprinkle the burgers with salt and grill each side until crispy, then move them to a cooler part of the grill to finish cooking. They should reach a core temperature of 50°C. At the last minute, place the cheddar cheese on top until it melts. 4. 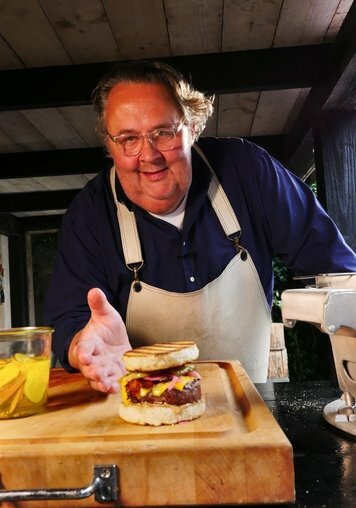 Toast the burger buns on both sides until golden brown and crispy. 5. Brush the bun bottom with some JBG burger sauce, then place the burger on top and layer on the onion compote and the crispy bacon. Top it off with some extra sauce and top the burger with the bun! Burger perfection. 100 g onion compote, see recipe below. 120 g JBG-burger sauce, see recipe below. Place the onions with some salt and glaze in clarified butter. Add the caster sugar and goose fat and stir until melted. Keep at low heat for another 20 minutes until the onions get a nice uniformly brown colour. Drain and season with salt and pepper. Blend the garlic and mayonnaise in the food processor until smooth. By hand, mix together the ketchup, pickle, sliced ​​onion and Sriracha. Warm the oil in a pan and fry to soften the onions. Add some salt to extract moisture from the onions. Add celery and the peeled tomatoes. Stir well. Let it simmer a while and then add the fresh tomato, brown sugar, mustard powder, cinnamon, cumin and paprika powders and finish with apple cider vinegar. Stir everything well and add hot water until everything is just covered. Let the mixture simmer for another 15minutes, then smooth in a blender and pass through a sieve. Season to taste with salt and pepper and even some more vinegar. Buy Julius Jaspers ‘Het ultieme Hamburgerboek’ ​for more delicious recipes. 1. Preheat the oven to 60 ° C.
2. Dry the slices of bacon for 1 hour on a rack in the oven. 3. Meanwhile, mix all the ingredients for the marinade. 4. Place the warm bacon in the marinade. Let marinate for 12 hours and turn occasionally. 5. Drain the bacon on a rack. 6. Mix the honey with the warm water and spread the pieces of bacon on both sides. Grill them to crispy on the Joy Stove and grease them in between with the honey. 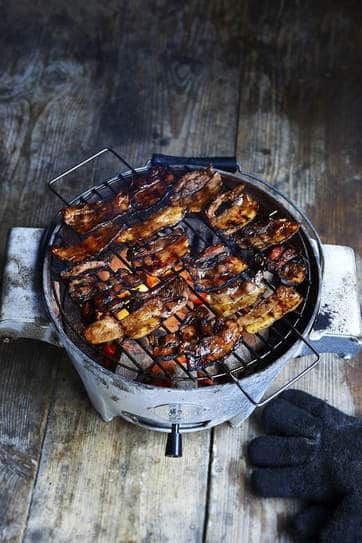 Buy Julius Jaspers ‘Oriental Streetfood’ ​for more delicious recipes. 1. Bring the potatoes to a boil in cold water with a little salt. After 10 minutes of cooking, check the cooking and remove from the heat if they are cooked, but still firm. Drain and rinse cold under the tap. 2. Ris the leaves of the rosemary twigs (save the cups). Make a hole with a satépen through the length of the potatoes and skewer on the bare rosemary twigs. 3. Place the potatoes for an hour in a marinade of oil, garlic and some of the roast rosemary (regular turning). 4. Let the potatoes drain and grill them around crispy. Make sure they are warm inside (place 1 extra potato on the fire to be checked) and sprinkle with salt. 5. Serve with the spice mayonnaise. Mix 450 grams of mayonnaise with the chopped leaves of a total of 15 sprigs of green herbs (parsley, celery, tarragon, dill, mint, chervil) and the juice of half a lemon. 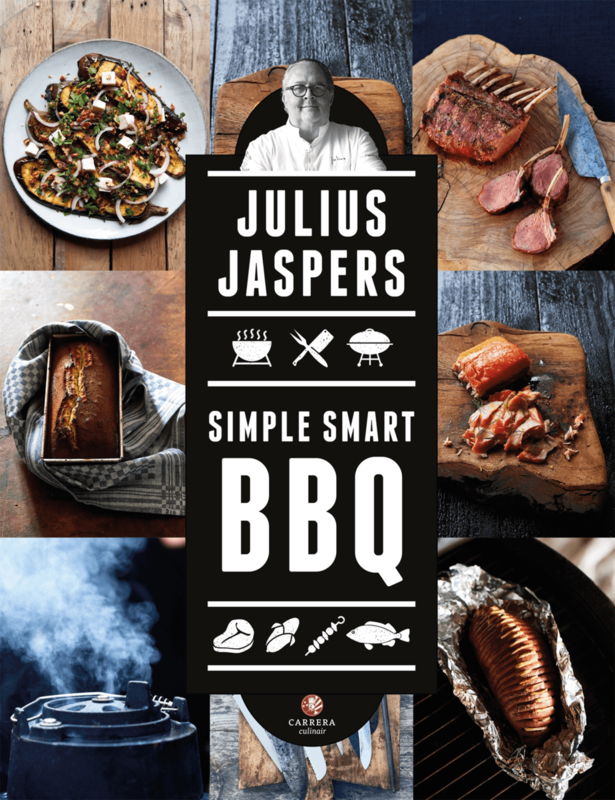 Buy Julius Jaspers ‘Simple Smart BBQ’ ​for more delicious recipes. 1. Cut the pumpkin into straight slices of equal thickness and remove the seeds. 2. Prepare a marinade of olive oil, honey and sage. Get the pumpkin through. 3. Sprinkle the pumpkin with salt and grill on both sides until crispy. Make sure the fire does not get too high, so that the pumpkin is cooked inside. 4. Put pieces of Chaource on the pumpkin and let it simmer / melt for another minute. 5. Sprinkle almonds over the pumpkin and serve immediately. 1. 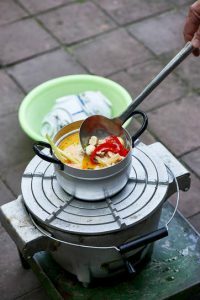 Fry the chicken and the chilli in the sunflower and sesame oil in a soup pan on the Joy Stove until the chicken turns brown. 2. Add spring onions, peppers, mushrooms, stock, coconut milk, lemongrass, lime juice and fish sauce and bring to a boil. Let simmer for 10 minutes. Season with fish sauce and pepper, pour the soup through a sieve and let everything cool down. 3. Fill 6 soup bowls with the cooked vegetables and chicken, bean sprouts, coriander and a few drops of chilli oil and sprinkle with the warmed * soup. Serve immediately. * This is the trick if you want to prepare it all, you can also continue working after step 2.